The Ackerman Hills course closed in Fall of 2014 and will re-open in 2016. Have you ever played Pinehurst No. 2 or Torrey Pines? If so, you know the special feeling of golfing at a distinctive venue. We are excited to be creating our own distinctive venue by renovating Purdue's historic Ackerman Hills Course under the creative magic of world-renowned golf course architect Pete Dye, who is donating his services. Ackerman Hills - formerly the Purdue South Course - originally was designed by Indiana Golf Hall of Famer Bill Diddle and built in 1934. It hosted the 1961 NCAA Men's Championships at which Purdue won the team title and Jack Nicklaus was the medalist. The course was modified in 1968 by Larry Packard to accommodate the expansion of the Tower Acres residential area. It was further developed from 1996 to 1998 as part of the opening of the Birck Boilermaker Golf Complex. Our objective now is to maintain the course's current parkland style and ensure that it is enjoyable for all to play with many of the same challenges that currently exist. At the same time, we want to add length in order to host championship-caliber events, while offering a variety of tee options to accommodate all skill levels. With the addition of two new holes adjacent to Cherry Lane and McCormick Road, we have expanded the course's footprint slightly to allow for better spacing and overall flow of play. Modern agronomic standards for turf varieties, drainage, irrigation, tee box areas and tree placement and replacement will be included in the renovation. The current severe sloping of some greens will be modified to accommodate the green speeds demanded and desired in today's game. The project also will address wetlands mitigation and storm-water runoff issues that impact the course as well as the campus footprint south of Stadium Avenue. The renovation was conceived by alumnus Jim Ackerman and Purdue director of golf Devon Brouse, and it is being made possible by major gifts from the Ackerman family as well as Samuel R. Allen (a Purdue golf team member in the mid-1970s), Mike and Kay Birck, and Fred Fehsenfeld. 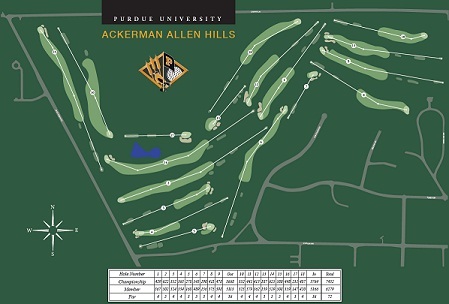 The Purdue Athletics Department will seek Board of Trustees approval to rename the facility the Ackerman-Allen Hills Course. It is our desire to respect the Purdue South Golf Course tradition while giving the university and our local community, along with the Boilermaker golf programs, the very best collegiate golf facilities in the country. 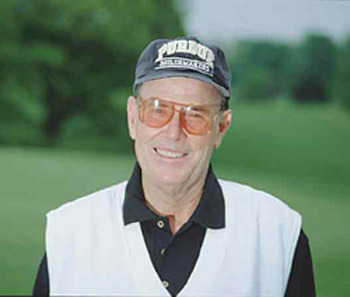 Upon reopening, the course will be included on the Pete Dye Trail, which presently consists of seven unique and challenging golf courses throughout Indiana, including Purdue's Kampen Course. The Kampen Course hosted the 2003 NCAA Women's Championships and the 2008 NCAA Men's Championships. These changes to a historic golf course are a tremendously exciting development for Purdue and for our community. We look forward to helping make Greater Lafayette one of Indiana's premier golf destinations. When is the course closing? The Ackerman Hills course will close on Monday, October 13, 2014. Why is the course being renovated? The upgrades will modify the course to make it more appealing to a wider range of players while maintaining its current parkland style and addressing several agronomic issues and a deteriorating irrigation system. Furthermore, the upgraded course will be a practice and competition resource for Purdue’s nationally ranked golf programs, with the entire Birck Boilermaker Golf Complex ranking second to none among collegiate facilities. The project is anticipated to begin in the fall of 2014. The entire course will be closed in 2015 and re-open in 2016. Will football game-day parking be affected? Football game-day parking will not be affected and will, in fact, be enhanced by the upgrades to the course drainage. Who is designing the upgrades? Pete Dye, regarded as the father of modern golf course architecture, has agreed to donate his design services. He previously designed the Kampen Course at Purdue, which is widely regarded as one of the top collegiate courses in the nation, having hosted the 2003 NCAA Women’s Championships and the 2008 NCAA Men’s Championships. What is the Pete Dye Trail? The Pete Dye Trail presently consists of seven golf courses throughout Indiana, including Purdue’s Kampen Course, and combines challenging courses and unique destinations.